• Get Products Quotes From Customer. • Replace "Add to Cart" With "Request Quote". 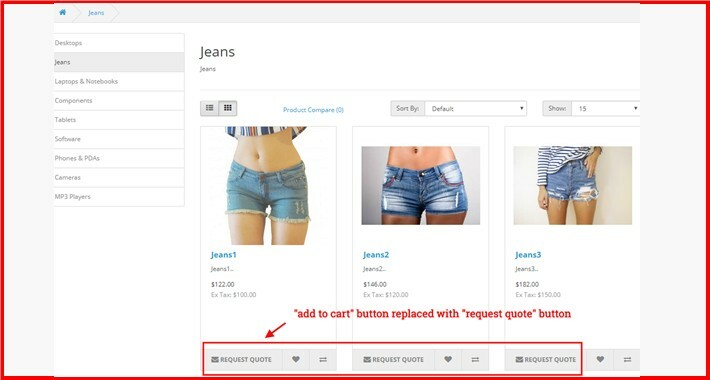 • E.g : Request Quote Buttons Apply on all products of "Jeans" Category. • Product option : product option will required when Request Quote. • Out of stock Product : Automatically Replaced Add To Cart To Request Quote. • When price is Zero : Automatically Replaced Add To Cart To Request Quote. • Popup box : Quotes Cart and Form Display in popup box. • Quotes Cart : Add product, Delete product, update quantity. • Quotes Confirmation Email : Admin & Customer both will get Quotes confirmation email. • Quotes email will have all details of Quotes Form and Quotes products like name, model, image etc. • Quotes Orders list has Quotes id, store, email, date added. • Quotes History : Add History, Notify customer, Attach file when history added. • Multi Language + Multi Store + Customer Group Compatible. • 4. Admin > Extension > Module > Request Quote > Install And Configure It. • 5. Admin > System > Users > User Groups > Set permission > Save. • 6. Admin > Request Quote > Quotes Custom Fields > Create unlimited custom fields. • 7. Admin > Request Quote > Quotes Orders > List of submitted Quotes. For some reason it stopped working. I contacted support and within minutes it was back to working. Very happy :-) Highly recommended extension.